The Green Tree Historical Society has a treasure trove of photos, documents, and information about Green Tree Borough and some of the surrounding areas. Would you believe that a small borough (about two miles square with less than 5,000 residents) could have so much to boast about? We do! Stop by and learn how Green Tree Borough became such a great place to live, work, and play! Hours: Tuesdays 9:00 a.m. to 12:00 noon, Saturdays 10:00 a.m. to 12:00 noon, or by appointment. The Green Tree Historical Society was chartered in 1986, shortly after the celebration of the Green Tree Centennial in 1985. The Centennial Celebration had piqued residents' interest in Green Tree's history and a group of them organized to create the Historical Society. Much research had been done on Green Tree's history as part of the Centennial Celebration and it helped to lay the groundwork for the establishment of a historical society. The founding members collectively held a lot of history themselves, and the society started with a concentration on the people of the borough, their lives, and the homes. They started collecting a number of oral histories from residents who had spent their lives in Green Tree, videotaping their memories and recollections of days gone by. The Historical Society still has these oral histories on hand and is in the process of transferring them to a digital format. The historical documents grew with newspaper clippings, photos, and other records. People donated items or passed them onto the Historical Society when they moved or were cleaning out their homes. Local clubs and organizations offered their old documents to the Historical Society for safekeeping. And the members of the society have always been searching for additional information to add to their collection. The Green Tree Historical Society is the guardian of the borough's narrative, one that stretches back to the 1700's. The Historical Society is working on bringing their history into the 21st century by digitizing card catalogs and videos and creating an electronic reference system to catalog items, articles, and other information. A pictorial history of the borough will be available soon. Stop by on Tuesday mornings from 9:00 a.m. to 12:00 noon, or Saturdays from 10:00 a.m. to 12:00 noon to browse, seek out information, or just immerse yourself in your community's history. Can't make it on a Tuesday or Saturday morning? Call 412-921-8013, leave a message, and someone will get back to you to see the Historical Society at a time that suits your needs. The Historical Society loves to give tours to schools, groups, and organizations. The Green Tree Historical Society is located behind the Green Tree Public Library in the rear hall on the first floor of the Green Tree Municipal Center. Contact the Green Tree Historical Society by emailing greentreehistory@hotmail.com or calling 412-921-8013. Hours are Tuesdays from 9:00 a.m. to 12:00 noon and Saturdays from 10:00 a.m. to 12:00 noon, or by appointment. Local, county, state, and American histories in and near Green Tree. Complete bound collection of the Chartiers Valley Life weekly newspaper, 1923-1956. Census information from 1790 to 1930 on CD. Collections of local school class photos. Aerial photographs from the 1930's through the 1990's. Oral histories of Green Tree residents. Family history files and home history files - great for genealogical research! Minutes and photo albums from local civic groups including the American Legion, Woman's Civic Club, PFOs, GAA, etc. Property assessment books 1976-1980 and 1986-1991. Thousands of photos, news clippings, and other memorabilia. Green Tree was named for a large sycamore tree along Greentree Road where the stagecoaches would deliver mail. It was a place to meet in the community. The borough's logo is a drawing of the original Green Tree. 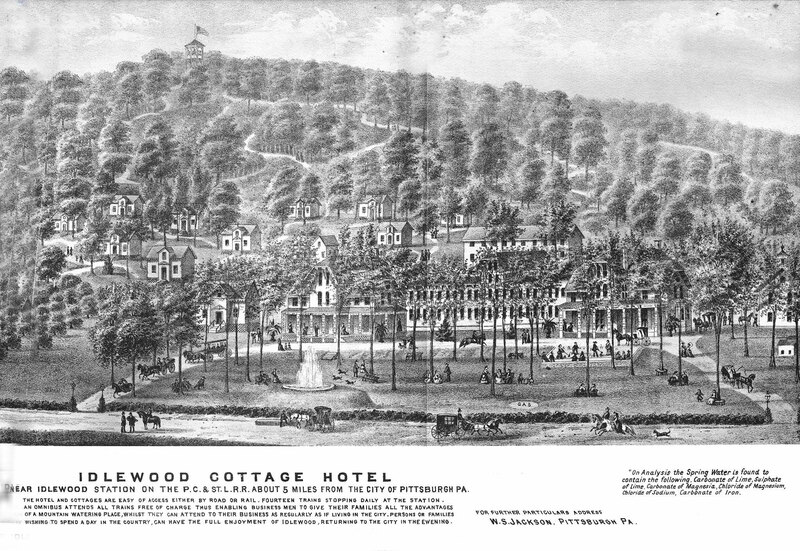 Green Tree was known by many other names before it became Green Tree, such as Peters Township of Allegheny County (1781-1788), St. Clair Township of Allegheny County (1788-1805), Lower St. Clair (1805-1851), Chartiers (1851-1860), Kirkpatrick (1860-1861), and Union (1861-1885). It became Green Tree in 1885. Green Tree was once part of the state of Virginia. The Green Tree Public Library was started in the 1940's at the urging of the literacy group of the Green Tree Woman's Club and staffed entirely by volunteers. The Green Tree Police Department was started in 1908 with one part-time officer. In the early 20th century, Green Tree grew as a result of the Wabash Railroad that built Rook Station. Since incorporated in 1885, Green Tree has always had a local school (School Street School, Manilla Avenue School, and Aiken Elementary). George Washington traveled Greentree Road using the Native American trail in search of a more direct route between Fort Pitt and Fort Henry in West Virginia.